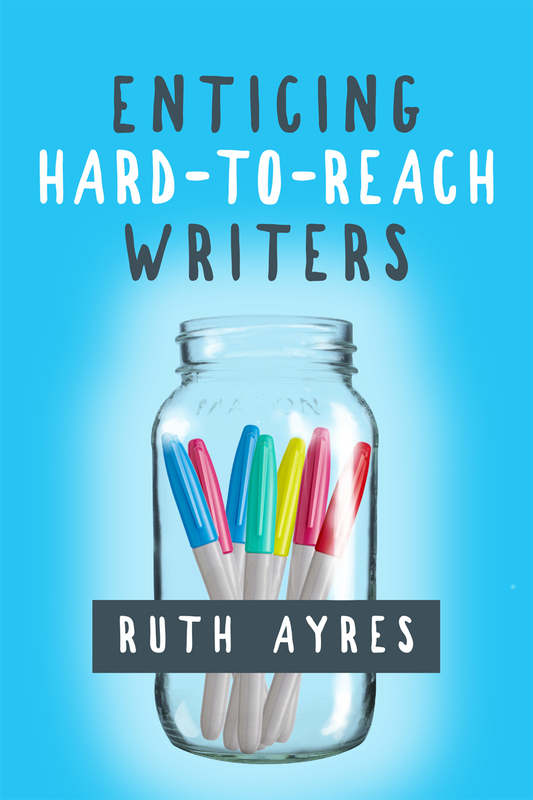 There's a chapter in the middle of Enticing Hard-to-Reach Writers by Ruth Ayres titled "Everyone Hates Writing." This chapter has my name all over it. Writing is hard for me and pretty low on my preferred activity list. My bathroom sparkled when I was writing my dissertation. I often found other tasks, including scrubbing soap scum off the shower walls, that just had to be done so I wouldn't have to write. I related to the chapter, but it also reminded me that I am not alone. I have chosen to avoid writing again and again, but so have others, even those who write for their profession. In our classrooms, there are also students who hate writing because it is hard or meaningless or not their preferred activity of choice. They also have a myriad of reasons not to write, whether it's the lack of a pencil or an idea or the desire to share their words with others. Negative thoughts about writing are not foreign to me. Yet, I write because I know writing changes me. I am influenced by the writing of others. I become a better educator every time I read a blog post, article, or professional book on literacy instruction. I also become a better educator every time I write about my practice as it leads me to understand and reflect. I've connected with and inspired others through my writing. Writing is important and essential. As much of a struggle that writing is for me, I love to teach writing. My belief that there is power in words is one that I want my students to understand and experience. Even when our students hate writing they deserve to be enticed, to become a part of a community of writers who share their stories to bring light to their own lives and the lives of others. As the title suggests, Enticing Hard-to-Reach Writers offers insight into the how and why of enticing those student writers who are struggling and reluctant. In Part I of the book, Ruth guides us to better understand students who have to be enticed. She includes personal stories about her children who have come from hard places and explains how trauma impacts the brain and learning. Part II of the book explores how we can create an environment that supports students who avoid writing or find it a hard or even impossible task. The chapters highlight the importance of writing workshop and being a writing teacher who writes. In Part III, Ruth offers practical suggestions for moves we can make that will support student's confidence in themselves as writers, strengthen their beliefs in the power of their stories, and help them develop their writing skills. Ruth's book is a professional text, providing ideas for writing instruction that will support all writers including those who have experienced trauma, but it is also the story of an educator whose personal and professional experiences have shaped her beliefs about writing, writing workshop, and teaching students who have lived in dark places, but with time and support can heal. There were parts of the book that moved me as I read Ruth's stories and thought about students I have taught who have also come from hard places. As I read chapter after chapter, I also found myself thinking about how the writing could serve as a mentor for myself as a writer. This book is inspirational and practical, but also relevant as we can all think of students in our classrooms who've needed to be enticed to write. I have this by Ruth and it is wonderful. I hope more discover how helpful it can be for all writers. You're right, Lisa, it is for everyone, and also terrific for teachers and their students. This line from your post is so powerful - "Negative thoughts about writing are not foreign to me. Yet, I write because I know writing changes me." We agree - writing is hard and it also changes us. Thank you for sharing your struggles. It helps all of us become a whole lot closer when we understand how much we have in common. Enticing Hard-to-Reach Writers sounds like an important book. I especially like hearing that it has a section on writers who've experienced trauma. It's too easy to think all our students have similar backgrounds. Thanks so much for sharing! This sounds so inspiring, and practical - I lead a writing workshop at the library, and many of my participants have been dragged their very unwillingly by their parents, convinced that they "can't" write. This sounds like a great book to add to my professional toolbox! Thank you for your kind words about Enticing HTR Writers! I'm honored that my words can serve as an inspiration and mentor to you as you stack your own words. Our stories matter and I'm glad you are telling yours!